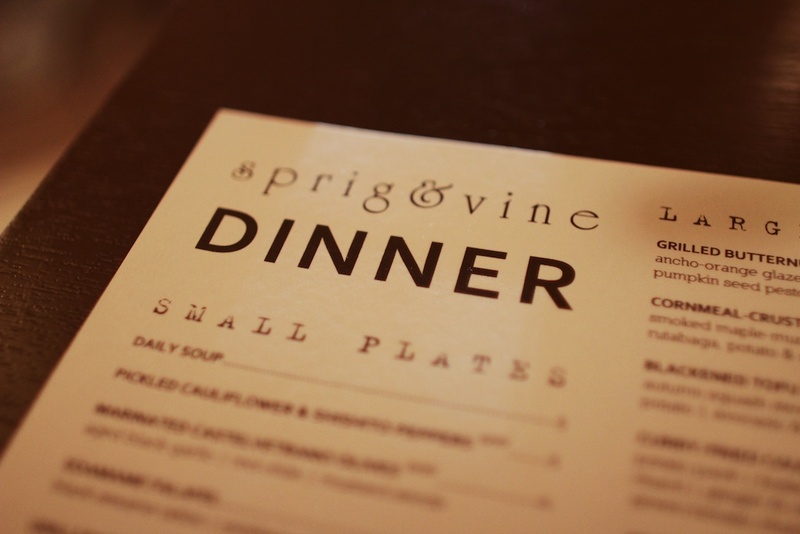 While traveling back east, Shawn and I visited this charming restaurant, Sprig & Vine, in New Hope, Pennsylvania. Their all vegan menu had a different vibe than what seems to be popular at the moment; an exciting change for me. 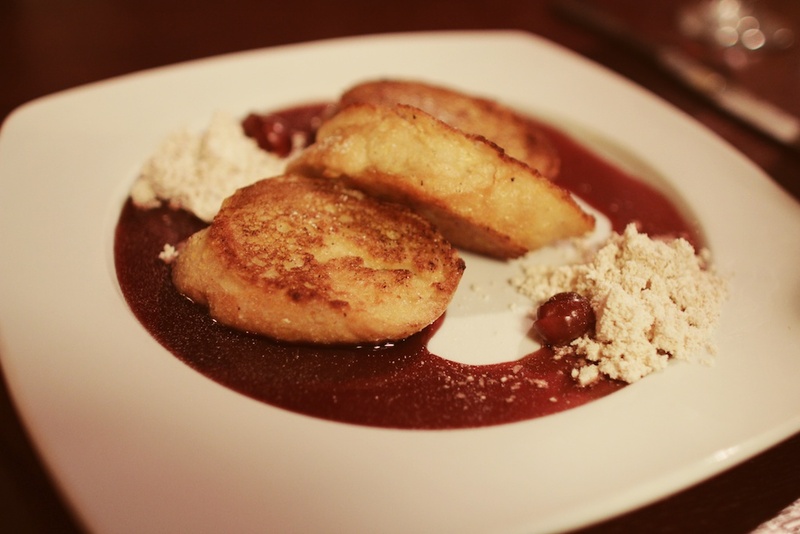 Each dish focused on the local fresh vegetables and grains and combining flavors and spices rather than trying to emulate more traditional recipes. 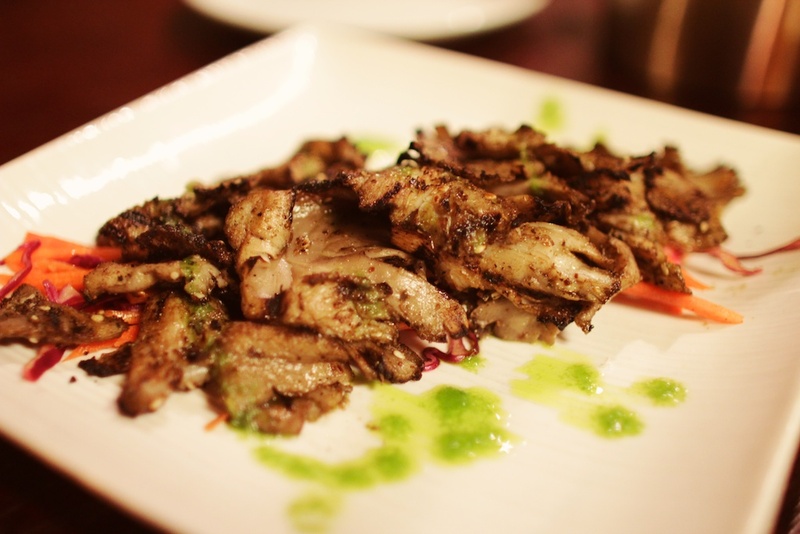 We opted to order a handful of the appetizers for the table and began with the grilled oyster mushrooms. They were gently spiced and perfect to start. 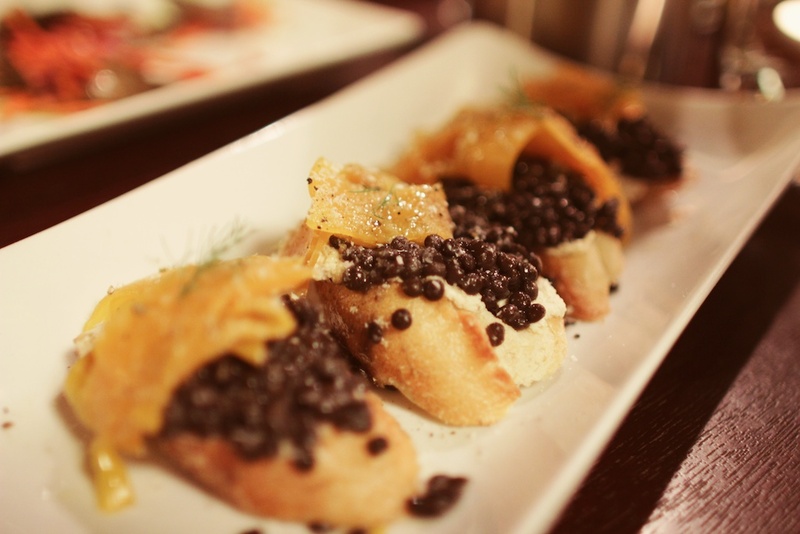 Next were the roasted gold beet crostinis topped with black beluga lentils and smoked cashew ricotta, my favorite of the lot. 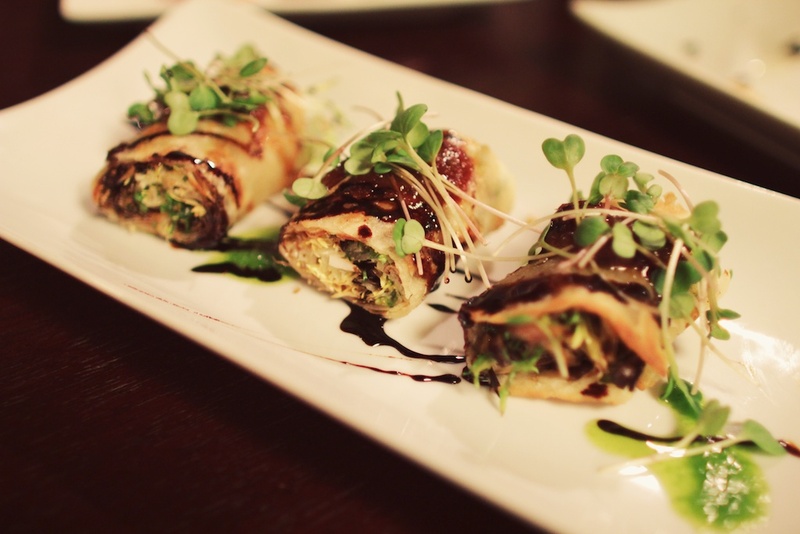 We also tried the green onion pancake rolls filled with roasted mushrooms and sesame-tomato jam. Each plate had it’s own distinct flavor and style and I loved each one. For my entree, I couldn’t resist the pecan and kabocha squash ravioli. I was totally surprised at how many vegetables they packed into this dish, each one perfectly cooked and seasoned. Every bite was a distinct collection of flavors. 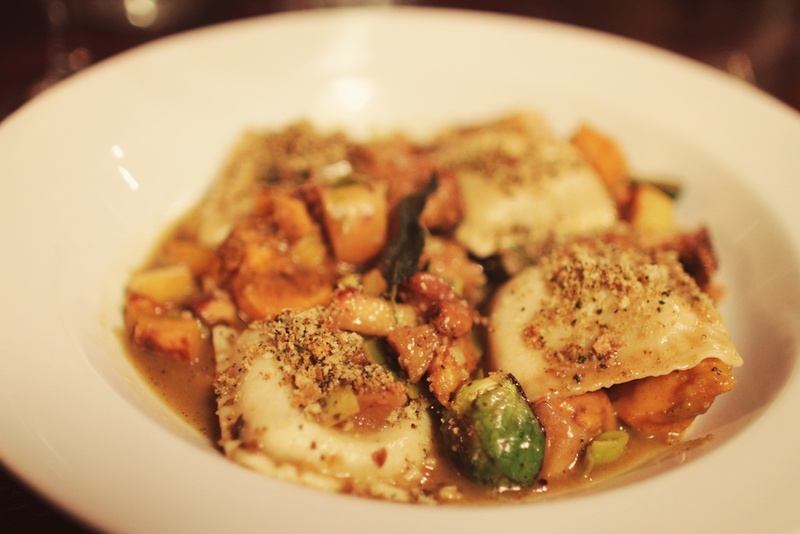 The raviolis themselves almost took a backseat to the amazing pieces of roasted squash and delectable Brussels sprouts. To finish things off, we all shared the peanut butter and jelly french toast. It sounds simple enough, and delicious enough, but it was quite unexpected. The peanut butter was actually as sweet powder and the jelly was a wonderful fruit compote. Though we were all quite stuffed, it was a nice treat. I would love to visit again and try some more of the dishes. I loved that there were so many fresh vegetables in each plate prepared carefully and thoughtfully. I wish more places would focus on including such a wonderful selection of vegetables in their menus. that’s one of my favorite restaurants! i live close to new hope and love to take a day trip up there, walk around and visit all the cute little stores, and finish the day off eating at sprig and vine. i’m glad you enjoyed it, too! I have to get there for dinner one day, but their lunches are AMAZING. Check them out in the afternoon when you get a chance. Incredible sammies to tide me over while The Cinnamon Snail is on winter break. Wow. I want to eat that. I just found your blog and I am so happy! I love it! 🙂 Sprig and Vine is one of my favs.